A radio telescope once used to track ballistic missiles has helped astronomers determine how the magnetic field structure and rotation of the young and rapidly rotating Crab pulsar evolves with time. The findings are published in the journal Science today (Friday). 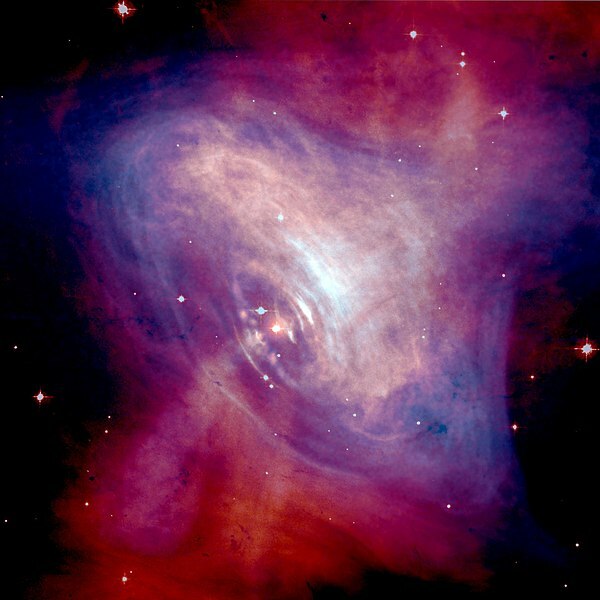 The Crab pulsar is a neutron star which formed in a massive cosmic explosion seen in both Europe and China in AD 1054 as a bright star in the daytime sky. Now rotating 30 times a second, this highly-compact star emits beams of radio waves that, like a lighthouse, produce flashes each time it rotates. The star itself is only about 25 km across but contains the mass of nearly 1 million Earths. Professor Andrew Lyne and his colleagues from The University of Manchester report on a steady change in these flashes during a 22-year experiment watching the star, telling us about its very strong magnetic field and helping us learn about the otherwise-inaccessible interior of the star. The flashes, or pulses, come in pairs. The new observations show that the spacing of these pairs of pulses is increasing by 0.6 degrees per century, an unexpectedly large rate of evolution. The scientists have shown that this means that the magnetic pole is moving towards the equator. The astronomers employed a 42-ft telescope that was formerly used to track the Blue Streak missile at the Woomera Rocket Test Range in Australia until 1981, when it was dismantled, transported and re-erected at the Jodrell Bank Observatory in Cheshire, England. This relatively modest telescope has been used to observe the Crab pulsar almost daily for 31 years, during which time the pulsar has rotated 30 billion times, and Jodrell Bank has kept count of every rotation. The most accurate observations, made since 1991, show the small gradual change in the pulse spacing. 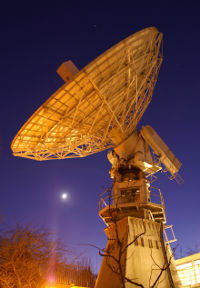 The 42ft Radio Telescope at twilight. Study lead Andrew Lyne, an Emeritus Professor at Manchester, said that the most surprising aspect is that this change is happening so rapidly, when the interior of the star is superconducting, and the magnetic field should be frozen in position.